In late November 1988, indigenous landowners on the island of Bougainville, part of Papua New Guinea (PNG), blew up electricity pylons supplying power to the huge Panguna mine. For years, they had put up with toxic pollution from the Anglo-Australian owned mine—and seen the profits enrich Australian investors and PNG politicians, not the local Bougainvillean people. A bitter war for independence against the PNG government lasted almost ten years, at the cost of 20,000 Bougainvillean lives, about a tenth of the island’s population. Disgracefully the PNG government’s war was fuelled and funded by the Australian governments under Labor’s Bob Hawke and Paul Keating. Courageously, the Bougainivilleans fought them to a stand-still. The mine has been shut ever since. With a poor copper and gold yield-per-tonne-of-soil, Panguna was an open-cut mine. At the time it was the second biggest open-cut mine in the world—a large enough hole for the Central Business Districts of either Sydney or Melbourne to fit inside. This hole is on an island which is only 200 kilometres long and 80 kilometres wide. The mine was imposed on Bougainville as a result of Australian colonial control of PNG. Australian control began in 1884 with the annexation of the southern part of New Guinea—Papua—and continued until independence in 1975. By that time, with the de-colonisation of much of the Third World, Australia was under pressure to grant PNG independence. But in 1966, the country did not have a single university graduate. In the lead up to independence, the wealth of Panguna’s copper and gold reserves was seized on as a way to fund the newly-independent government. 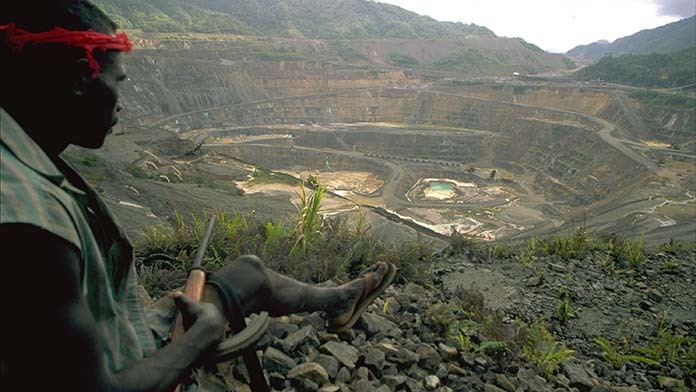 Australian mining company CRA (now Rio Tinto) owned the mine, meaning Australia could take a share of the profits and retain economic control of PNG. But building the mine meant seizing land from local landowners. Bougainville was a village-based society dependent on farm gardens and fishing, where access to land was at the centre of social life. Almost 97 per cent of land in PNG is owned through customary law. PNG’s system of customary land tenure means “ownership” is a community right which is granted to individuals and families by agreement. On Bougainville the concept of selling or acquiring land was totally foreign to the people. The colonial authorities found out as early as February 1964 that they would have to ride roughshod over the local landowners to get the mine built. Landowners confronted the mining company’s geologist Ken Philips when his team began entering their land, cutting down trees and constructing huts. The people did not want the mine. A legal challenge in 1964 failed. The court was packed with expatriate Australian judges, who unsurprisingly ruled in CRA’s favour. In 1965, villagers threw out an exploration team. The landowner opposition was so great that Australia’s External Affairs Minister, Charles E Barnes, flew to Bougainville in mid-June 1966. His visit only inflamed the situation further. Barnes told Kieta villagers that the project would not benefit “them or their grandchildren” but PNG, “as a whole”. They were not about to sacrifice their land for such an empty promise. In the wake of Barnes’ visit more and more local people refused CRA employees access to their land. In spring 1968, protest meetings were held in the mountains and on the coast. Two hundred landowners marched on the mine site at Panguna. Protests continued into 1969 when the coastal villages of Rorovana, Anewa and Arawa were acquired to build a deep-water port to ship out the copper and gold, and a township for a mainly expatriate Australian workforce. On 1 August 1969, 100 police were sent to protect the surveyors as they marked the boundaries of CRA’s acquired land. A group of 65 unarmed villagers stood their ground as the Australian Colonial Authority’s District Commissioner, Ashton, led PNG riot police to force people off their land. Ashton later admitted he had offered the locals a “mere pittance” for it. After 150 tear gas shells failed to move them, riot police waded in with their truncheons. An editorial by Adrian Deamer, in then left-leaning The Australian, said, “The use of tear gas and clubs to enforce alien laws on an uncomprehending people was a damning indictment of the Administration of PNG—which is to say of Canberra.” It was a clear warning of what Australia was willing to do to force the Panguna mine on Bougainville. Villages lost large areas of land to the huge open-cut mine. The copper pollution of nearby rivers was devastating to the overwhelmingly subsistence economy. It killed off animal and plant life in and around the water. People who hunted, fished and grew vegetable plots could no longer do so. Between 1968 and 1974, the average amount of compensation individual landowners received was $224. They received just 1.4 per cent of total profits between 1972 and 1989 in compensation and royalty payments. By the mid-1980s, a younger and more educated generation of landowners had become frustrated by the scale of the environmental damage, the pitiful royalties paid to landowners and by what they saw as a weak Panguna Landowners Association (PLA). In 1987, Perpetua Seroro and her cousin, Francis Ona, won the elections to head the PLA. The PLA demanded CRA pay multi-billion dollar compensation to landowners for the environmental damage, 50 per cent of all profits from the mine and the withdrawal of PNG security forces. When CRA stalled on the PLA demands, they began sabotaging the mine. CRA executive Don Carruthers flew to Port Moresby to hold “urgent talks” with PNG Prime Minister Rabbie Namaliu. In May 1989 the mine was forced to shut. In response to the PLA’s campaign of sabotage the PNG government first sent in its notoriously brutal armed riot police and later the PNG military. The new PLA became the nucleus of the Bougainville Revolutionary Army (BRA), formed to fight a guerrilla war against the PNG Defence Forces (PNGDF). Sam Kauona, originally from Bougainville, was a Sergeant in the PNGDF. When he returned to Bougainville to visit his sick wife, what he saw and heard, led him to join Francis Ona and become the BRA’s military commander. The PNG government drew 16 per cent of its income from the mine, around $1.5 billion over its period of operation. It was desperate to keep it open—and also feared that if Bougainville became independent it could encourage secessionist movements elsewhere in PNG. Bougainville already had a history of demands for independence. The island’s population is ethnically and culturally closer to the Solomon Islands than to the rest of PNG. Located at the eastern-most point of PNG, it is just seven kilometres from the Solomon Islands but over 500 kilometres from the PNG mainland. It was only grouped together with Papua as a result of a deal between the colonial powers, Britain and Germany, carving up the area in 1899. In 1962, the issue of secession was raised following a revolt on the northern island of Buka against a new tax. Even as PNG as a whole moved towards independence, there were demands for a referendum on Bougainville’s status inside PNG. Representatives of Bougainville’s local government bodies made a unilateral declaration of independence in 1975, after the PNG national government refused their request for a degree of autonomy inside the new country. They were eventually granted their own provincial government in return for agreeing to remain inside PNG. In May 1989, when it was clear that the PNG defence forces were not going to retake Panguna easily, the Hawke Labor government “lent” PNG four Iroquois helicopters, ostensibly for medical evacuations. The PNGDF promptly rigged them with machine-gun mounts and used them as gunships. Australia later supplied PNG with an undisclosed number of machine guns, another 750 self-loading rifles, 6000 mortar rounds, 200 light machine guns, and 200 M-16 Armalite rifles and ammunition. From 1989 to 1995, over half of PNG’s military spending was financed by Australia. By 1996, Australia had provided at least $250 million to PNG for the war on Bougainville. As a matter of routine, PNGDF officers were trained by the Australian Defence Force in Queenscliff. Those likely to be stationed on Bougainville would undergo “counter-insurgency” training at the Canungra army base in Queensland. The Australian government had its own reasons for wanting to end the rebellion on Bougainville. It had opposed West Papua’s bid for independence from Indonesia in the 1960s and East Timor’s in the mid-1970s. Like the PNG government, it feared that Bougainville’s independence could encourage other similar movements, potentially creating a host of smaller states where other rival imperialist powers could establish a foothold. Even before Federation, the emerging Australian ruling class had developed its own imperialist interests and sought to dominate the south Pacific. Australia’s initial reason for taking control of PNG in the 1880s was strategic. It wanted “to deny the use of the area to any other power”, as External Affairs Minister Paul Hasluck put it in 1961. PNG’s position to our immediate north meant it was viewed as part of a “forward defence shield” for Australia and as an area that Australia’s rulers had a right to dominate and exploit. The profits of CRA and other Australian mining companies in PNG added to the bargain. Since opening in 1972 CRA had dug up $7 billion of copper and gold. It was literally—for Australia, PNG and CRA—an asset worth killing for. The Hawke Labor government, in particular Defence Ministers Kim Beazley and Robert Ray and the Foreign Affairs Minister Gareth Evans, played a despicable role in fuelling the war. The Bougainville war showed Labor’s willingness to extend Australian imperialism and ruthlessly act in the interests of Australia’s ruling class. But the Bougainville Revolutionary Army, supported by the population, grew to the point where in March 1990 it forced PNG riot police and the PNGDF off the island. In May, Francis Ona, as head of the Interim Government, declared Bougainville independent. PNG’s response was a murderous naval blockade, cutting off supplies including vital medicines to the people of the island. In April 1994, Labor Senator Stephen Loosely led a Parliamentary delegation to the re-captured parts of Bougainville. His report recommended the continuation of the blockade. Australia advised PNG on “counter-insurgency” tactics which led to the setting up of “care centres”, which were supposed to isolate the BRA from its civilian support base. Just over one-third of Bougainville’s population were forced into 46 “care centres”. The PNG Government promised to supply them food, shelter and medical supplies—but they were systematically deprived. A solidarity movement with Bougainville developed in Australia. In 1993, the annual conference of the Waterside Workers Federation, part of today’s MUA, and the NSW Labor Party branch both called for the lifting of PNG’s blockade of Bougainville. Then in January 1994, workers at the Port Kembla Grain Terminal voted unanimously to support a ban on exports to PNG. The bans were in protest at the atrocities being committed by the PNGDF to recapture Bougainville. They led to the delay of a grain carrier, the Goplai, bound for PNG with Australian grain. Pressure began to build up within the union movement such that Gareth Evans met Martin Ferguson, then the President of the ACTU, in order to overcome the “threat of more union bans” over the issue. By May 1994, six Trades and Labour Councils had backed a resolution calling for a trade ban on PNG. More than 300 delegates at a 1994 NSW Teachers’ Federation Council unanimously supported a ban on PNG trade and lifting the naval blockade. After a war of attrition with the BRA fighting PNG to a standstill, Australia wanted to end the instability and brokered a peace deal in January 1998. In a defeat for Australian imperialism, the mine has remained closed, despite untapped mineral wealth worth at least $7 billion. The Bougainville government that emerged from the peace deal imposed an indefinite moratorium on any new mining. In recent years the Australian company RTG mining has won some landowners to its proposal to reopen it, but the question is far from settled. But Bougainville is set for a referendum on independence in June 2019. Some in the government say revenue from the mine will be needed to fund a newly independent state. Australian mining companies are desperate to make sure they grab a share of the potential profits. The Australian government will also be keen to ensure that it is Australia, and not other powers, that wields influence in Bougainville and PNG, and ensure that it is Australian multinationals that take the spoils of any mine. The recent jockeying at the APEC summit in Port Moresby revealed the ongoing imperialist rivalries in the region. China tried to outbid the US, Australia and Japan in promising infrastructure to win influence with the PNG government. The damage and destruction inflicted on Bougainville shows where this can lead—and why we have to oppose Australian imperialism. Bougainville’s resistance, with solidarity in Australia, defeated Australian imperialism last time. It can do so again.